Being Google AdWords certified is unbelievably helpful for those wanting to advertise either their own website, or their company’s website on Google. You don’t need to become certified to start advertising on Google, but it will sure save you a ton of time in the long run. 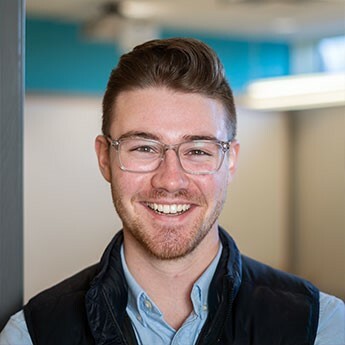 At Sherpa Marketing we are proud to be recognized as AdWords certified professionals (and Google Partner), meaning that we’ve passed multiple assessments that assess our product expertise. We are qualified to help you grow your business on the web using Google AdWords. And we want to help you do the same for yourself! When you type something into Google, in this case I typed “Sherpa Marketing”, you’ll notice that the very first thing that pops up is an advertisement for our company’s website. This was made using Google AdWords and can help people find your business, especially if you do not rank high on Google’s organic search (SERP - search engine results page ranking). For instance, if you are a hair salon and want to advertise to find staff members, you can make an ad that displays when people search for related keywords, such as “hair salon hiring near me”, “hair salons that are hiring”. It won’t be guaranteed that your ad will show up every time, it depends on a multitude of factors including budget, relevance of the ad to the searcher, the quality of your ad, etc. The good news is these are all things you’ll learn about in the Google AdWords course! Type “Academy for Ads” into Google, or follow this link. Sign into your Gmail account. If you don’t have a Gmail account you can try using your regular email, to be honest I am not sure if it will let you sign in with something besides a Gmail but it’s worth a try. If not, it is very easy to make a Gmail account. To get AdWords certified you will need to complete your AdWords Fundamentals, along with one of the other 5 options. These options are: AdWords Mobile Certification, AdWords Search Certification, AdWords Video Certification, AdWords Display Certification, or Google Shopping Certification. You can tell by the red circled item above, that I chose to do the AdWords Search Certification. This is because it related best to what I intended to do with AdWords, creating search ads. Search Ads are what was circled in the first photo above. If your company does a lot of online sales, you may opt to choose the Google Shopping Certification or Display Certification. 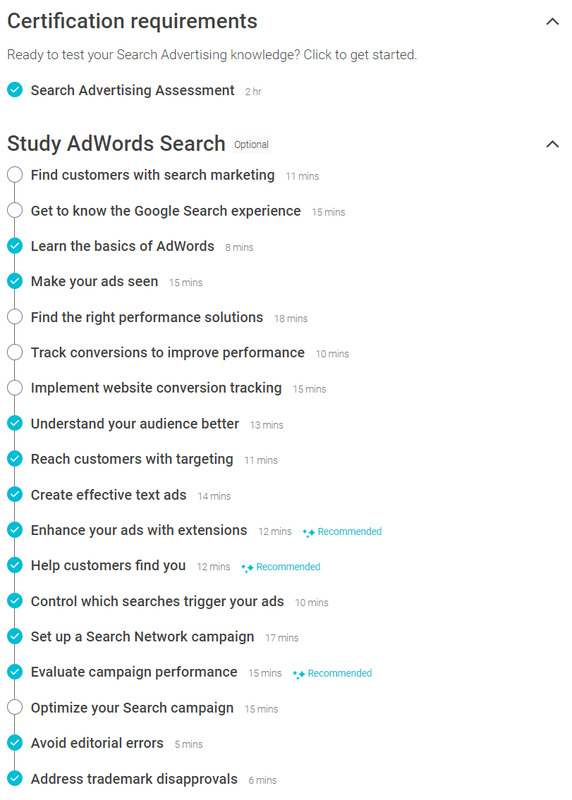 I recommend you do AdWords fundamentals first, where you’ll get a small taste of what each one of the next options entails, then you can decide after completing your fundamentals. Now that you’re all logged in and have had some time to familiarize yourself with the dashboard, it’s time for you to get certified! The suggested time to go through each one I found was fairly spot on, so if you go through all of them (which you should) it will take you roughly 220 minutes, or 3.7 hours. Let’s round up to 4 hours just to be safe. Next thing I would recommend is doing the practice assessment. This should only take about 15 minutes and is a much shorter version of the real test, giving you an idea of how you will do on the real thing. You might need to go back and re-do some parts on the checklist to get better at them. Alright now you’ve passed your practice assessment and feel comfortable in all your checklist items it is time to take the real test! It will time you and you only have 1.5 hours to complete it, so take a break, get some water, a coffee or whatever you need before starting! You will need an 80% score to pass, just like on your practice assessment. 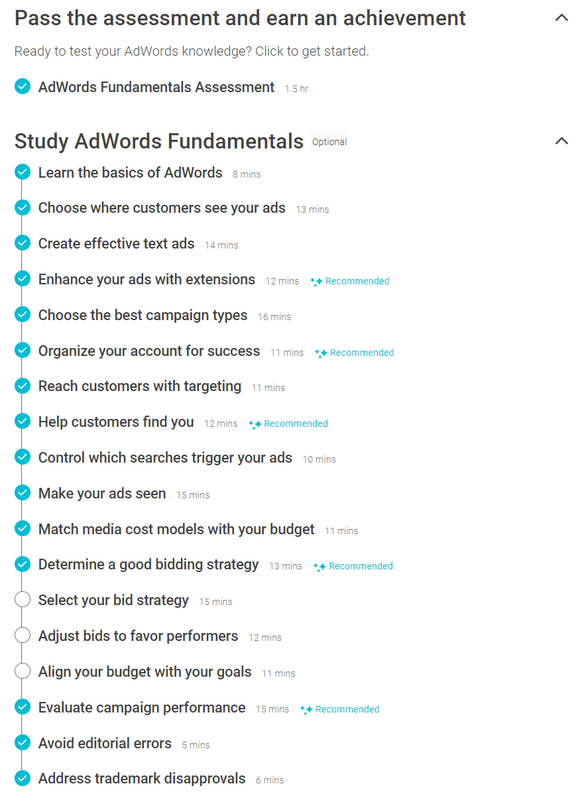 As mentioned earlier, to be Google AdWords certified you need to pass your AdWords Fundamentals (shown above), along with 1 of the other options. For the sake of this example I will walk you through taking the AdWords Search Certification, although the steps will be similar for each one. 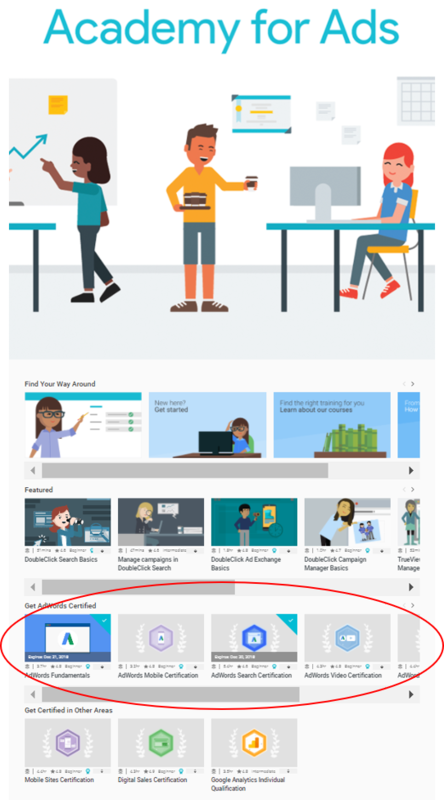 Log back into your Academy for Ads account you used for the AdWords Fundamentals. On your dashboard scroll down to the “Get AdWords Certified” portion, and click on the desired one, in this case “AdWords Search Certification”. Once again each of the times are consistent with how long each will take you. Thus, adding them all up this step will take roughly 222 minutes, or 3.7 hours. Next you should do the practice assessment which will be representative of the test. You can re-take this as many times as you want, and it will also give you suggestions on which parts on the checklist above you should re-do. When you’re feeling ready, you can click on the real assessment at the top of the list. You’ll have 2 hours to complete it and it will be timing you, so you can’t go overtime. Make sure to get cozy and settle in, it will take the full allotted time. You will still need an 80% or higher to pass so make sure you’re feeling ready before you start! Hope this helped you figure out exactly how to get Google AdWords certified! It’s not as daunting as you might have thought. Feel free to​ send us any questions you might have.